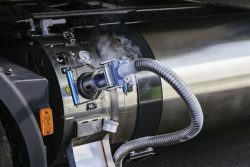 A year after winning the “Low Carbon Truck of the Year” title in the UK, the Stralis NP 460 has received another important award, having been voted “Sustainable Truck of the Year 2019” in the Tractor category. IVECO says the award, sponsored by Vado e Torno magazine in collaboration with Lifegate, confirms its position as European leader. Presented at Ecomondo 2018, the award adds to IVECO’s widespread recognition as a manufacturer of environmentally friendly vehicles, a position celebrated at the recent Hannover Trade Fair where the brand was the first manufacturer to present a 100% diesel-free stand. Ecomondo is an international event dedicated to all circular economy industry sectors. IVECO also won the “Sustainable Bus of the Year 2018” for the Crossway LE NP in the inter-urban category, and the 2019 title for the Crealis 18 m in the urban category. Now in its third edition, the Ecomondo award recognises the most significant innovations in clean transport and is sponsored by Vado e Torno in partnership with the Politecnico di Milano. 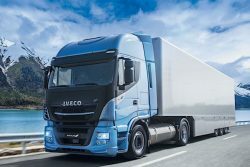 It was presented to IVECO’s most sustainable heavy road vehicle to date in recognition of its technical specifications, performance and technology.